Happy Belated St. Paddy’s Day! We are nearly a week after the big day but I am finally getting around to posting my Corned Beef and Cabbage recipe. I promise you – this is simple and basic… and delicious, of course. This is the perfect dish to prepare in the morning, go to work and then come home to dinner nearly ready. While growing up, our customs were regularly influenced by the Irish and German cultures. Every St. Paddy’s Day, corned beef and cabbage was served. 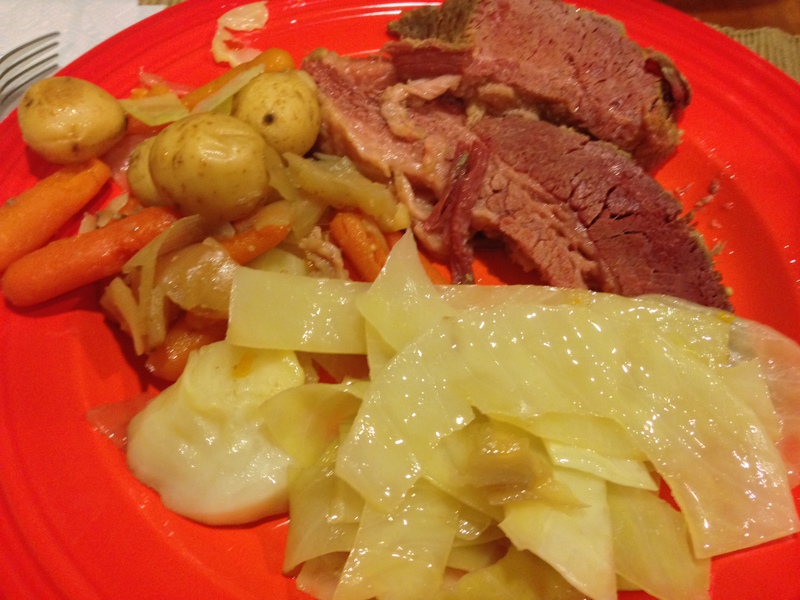 Corned Beef and Cabbage is traditional Irish meal. It’s sustenance… meat and hearty vegetables. I can see it being a very popular dish for farm families looking for something to feed the entire family and keep them feeling satisfied. The first thing you’ll need is a slow cooker (e.g. crock pot). Place it on LOW temperature. First, chop the onion in large pieces. It’s important that the onion is in large pieces since it will be cooking for so long. 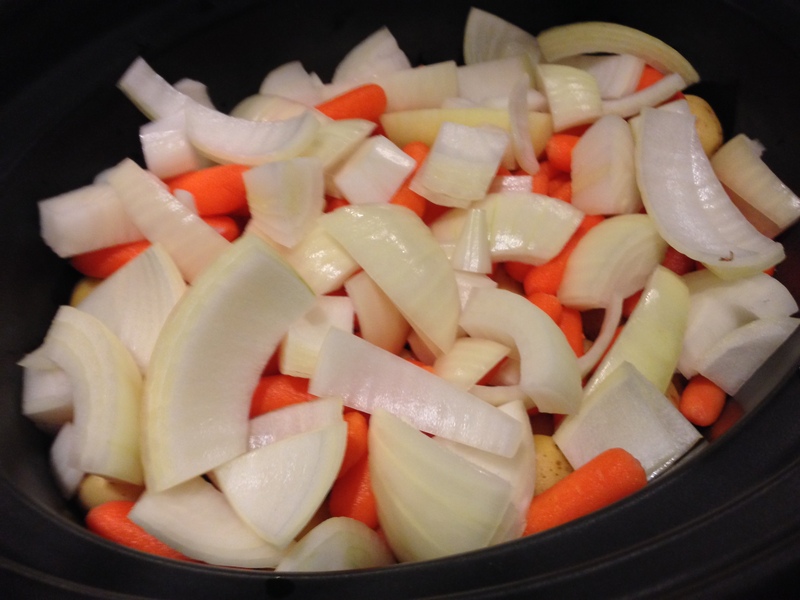 Add the chopped onion, potatoes and carrots into the slow cooker. I use the baby carrots and baby potatoes because it’s quick prep. If I am preparing this dish before work, I often do not have a lot of time and this works well for me. That said, it’s easy enough to chop these items yourself and add them into the crock pot. Next, add the corned beef on top of the vegetables. Sprinkle the contents of the seasoning packet on top. Add water to the crock pot and ensure the vegetables are covered and about 1/3 to 1/2 of the meat is covered with water. Now, it’s time to let it sit. 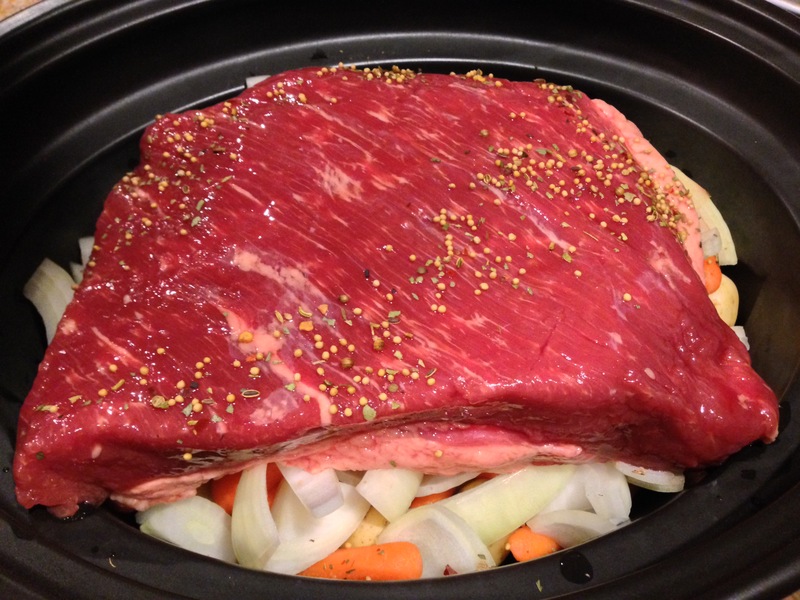 Cover the crock pot and let the corned beef and vegetables cook for a minimum of 8 hours on low. If you want to speed it up, you can cook the corned beef on high for 4-5 hours. That said, I recommend letting it cook low and slow. This year, ours cooked about 12 hours. After everything is cooked, chop up the cabbage into chunks and add to the crock pot to cook for 45 minutes – 1 hour. Now, it’s ready to serve! 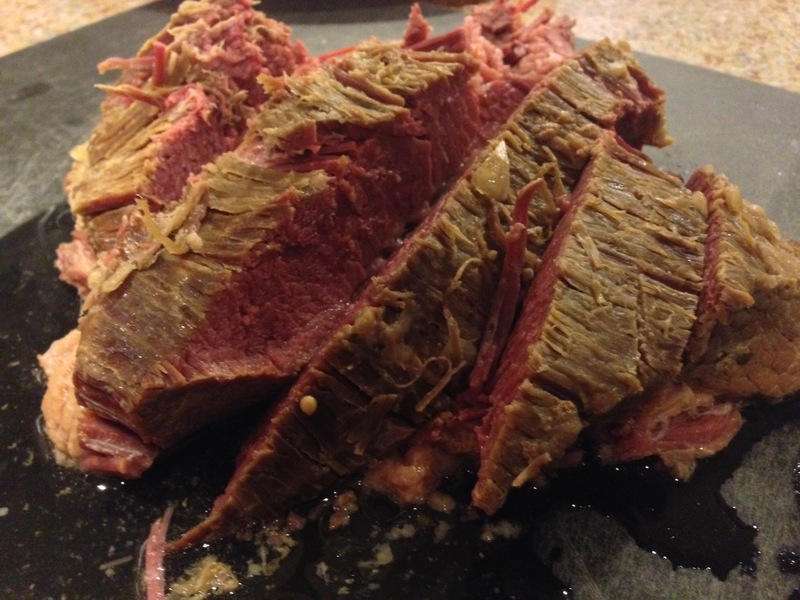 You can slice the corned beef… it should be very tender. I recommend purchasing some vinegar for the cabbage (makes it taste sooo good).